Trend have come up with this handy little design for a straightedge that could really help take the pain out of providing a clamped guide along which to guide power tools. I used the guide for a kitchen worktop which needed a little trimming and found the device more than useful. The soft pad adjustable friction clamps slide along the underside of the straightedge and, when screwed tightly, get a nice grip on the workpiece. 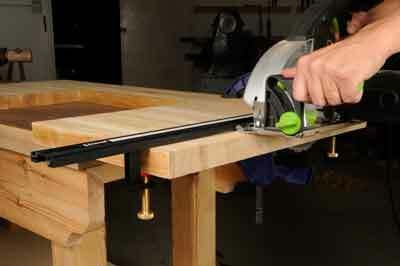 The guide is 900mm long and is designed for worktops and the like, and will clamp materials up to 51mm deep. The slideable tape measure is perhaps of limited use, but can give a rough idea of how far into the workpiece to cut. With the use of a rigged-up pointer aligned with the cutter edge it could help give accurate cut length, but that seems a bit of a faff. It is a decent enough bit of kit, but nothing that could not be achieved with a good straightedge and a couple of clamps. However, this piece will keep itself true thanks to its extruded design, and the integral clamps do make it easier to use. 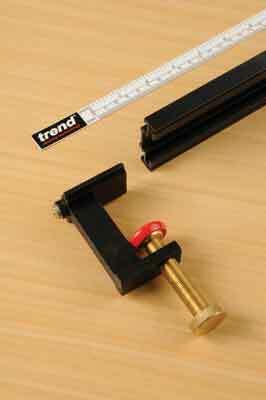 The guide can also be combined with Trends Varijig frame system, so if you already have that bit of kit then this addition makes a lot of sense. It is an effective bit of kit and is well put together, and useful with its inbuilt tape measure - which I would probably lose in a few days. It is pricey for something a straightedge and two G-clamps could achieve.